Youth may fade, but creativity need not falter. On his 90th birthday, Chuck Berry announced he had a new album coming out. Last spring, The New York Times reported on Geta Bratescu, a 91-year-old Romanian artist still hard at work in her studio. More than just a creative outlet, the arts offer a path to greater physical, mental, and emotional wellness for seniors. The U.S. government noticed too. In 1986, the National Institutes of Health suggested to sculptor Lolo Sarnoff that she might provide art workshops for people with Alzheimer’s disease. Sarnoff noticed that these creative seniors showed improved moods, less agitation and less aggressive behavior, positive effects that lingered even after they left the program. 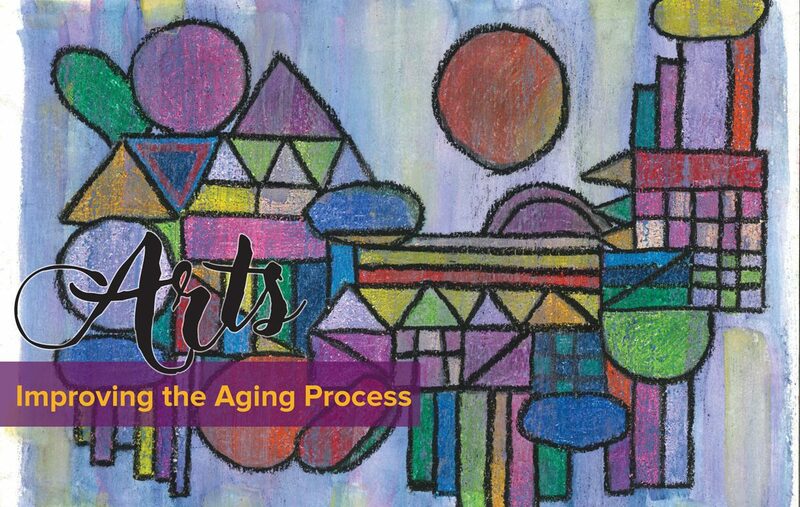 These insights led her to form Arts for the Aging (AFTA), a Maryland-based nonprofit organization whose work has helped to shape current thinking around the positive benefits of arts and creative activity among older adults. For seniors with diminished mental or communicative faculties, the benefits can go even deeper. Beyond the physical benefits, arts participation can re-open vital social avenues that might otherwise remain forever closed. “It gives us a new way to communicate as our bodies and our cognition decline and words fail us. That helps to alleviate the isolation that we now know contributes to poorer health outcomes,” she said. In the decades since Sarnoff first brought seniors into the studio, much research has been conducted to validate her initial impressions. Some of the scientific findings help to connect the dots between arts participation and improved aging. There are also senior living organizations that have been especially proactive in their embrace of the arts and a number of community organizations working to activate creative expression in the lives of older adults. They’ve all embraced varying, successful processes, considered best practices and offer ideas for senior living providers looking to improve their arts integration. NEA documented this in a 2017 report, “Staying Engaged: Health Patterns of Older Americans Who Engage in the Arts,” which offers a detailed look at arts participation habits, attitudes toward the arts, and related health characteristics of adults age 55 and older, as documented by University of Michigan researchers. Some of their key findings may come as a surprise. For example – fully 84 percent of those surveyed say they either create art or attend arts events. Of these, 64 percent create art of their own, 68.7 percent have attended arts events, and 48.6 percent both created and attended. Seniors care about art – 63.8 percent say they arts are important – and they believe that art engagement improves their quality of life: 54.9 percent say it helps to keep them active and engaged. As to health benefits, older adults who both created art and attended arts events reported higher cognitive functioning and lower rates of hypertension. Their cognitive functioning scores were seven-fold higher than for adults who did neither type of arts activity. A recent study from the Mayo Clinic validates these findings among the very-old adults. In this case researchers looked at 256 people in their mid- to late-80s to see which activities predicted or protected against cognitive impairment late in life. The behavior with the greatest protective effect: “Artistic activity,” such as painting, drawing, and sculpting. Participants who reported they were artists were significantly less likely to suffer from incidents of cognitive impairment than those who never created art or music. Those who kept creating in their later years did especially well, with just a 16.7 percent rate of mild cognitive impairment, compared to a significant 49.2 percent among those who were not engaged in artistic activities. It’s possible of course to question the causality. Does art make us healthier? Or are healthier people more likely to be able to take part in creative endeavors? There’s still much to be learned, but some researchers point to physical mechanisms that could help to explain how arts engagement does in fact promote wellness. All of this academic work only serves to bear out what artists have long suspected, and what many in senior living have believed. With that knowledge, a number of senior living operators have taken steps to leverage artistic expression in support of resident wellness. The breadth of arts activities in senior living is wide, from simple afternoon crafts activities to more structured, formal programs of engagement. Much will depend on resident ability and acuity. Still, looking across diverse efforts, some common themes may begin to emerge.